As some may know, in 2005, PC Pitstop added a Special Consideration to their EULA, that took over four months and 3,000 sales before being acknowledged by a consumer. The purpose of that exercise was to show the public just how infrequently EULAs are being read prior to the consumer accepting the terms. Since the article was published 2005, it has been sourced in multiple media & legal outlets in hopes of keeping the public aware of the trending issue of individuals blindly accepting these license agreements. Unfortunately, against our better efforts, the trend continues. In 2015, PC Pitstop decided to run their experiment again. 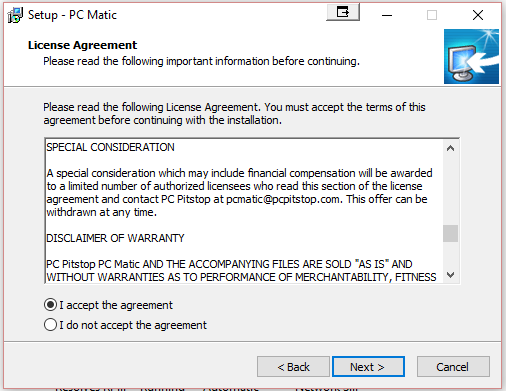 The Special Consideration was added to the PC Matic EULA, which can be seen below. After a month and a half and approximately 60,000 downloads, PC Matic customer, Stephen Ellerin came forward acknowledging that he had read the Special Consideration. Ellerin reported he “always makes a point of reading the EULA/Terms & Conditions” for any software he installs. In recognition of Mr. Ellerin’s diligence, PC Pitstop awarded him $500 and a complimentary lifetime upgrade for his current PC Matic license. Fortunately, PC Pitstop simply added the Special Consideration to gain insight into how many of their current consumers read the EULA. However, like Spotify, many companies use the EULAs as a means to gather additional data on their consumer base, often times without the consumers’ being aware. 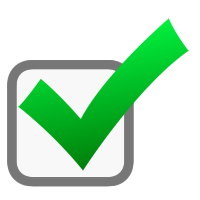 PC Safety, tips EULA. permalink. How about if the EULA's aren't 15 pages long and require an attorney to understand them????? I think they deliberately make them like that so we don't read them. How about the company sends you teh EULA before you buy the program/product?? then you can decide if it's for you or not. Seems fair!! Keith Elliott you just love being a trolling c-nt don't you. i guess that's why the call you keith! your logic is crap. Their going to be bored stiff with my personal information. I started out reading them, became lost in the mire and now just check for the "add on" junk before accepting. Concise wording, easy to comprehend would convince more of us to read them through. A very useful service would be to create a EULA watchdog site, which users could visit before installing software so that any overbearing EULA’s could be made known the public before blindly accepting them. Computer users are bombarded with EULAs at every site/service we subscribed to or join. What are we do do, keep a lawyer beside us to go over all of the EULAs that are put before us? It just could be that 40 pages of legalese in a small box that can't be resized makes the EULA nearly impossible to read let alone understand. Keith Elliott Just how many times have the provisions being rejected been acknowledged by the publisher? In my experience, the ONLY recourse we have as consumers is to not accept the EULA in its entirity, and not to use the software… in fact some EULA's even state that installing the software, not using it, is acceptance of all the terms of an EULA, and they have the irrevovable right to spy on you, take your possessions, and sell your belongings to anyone they deem suitable to give them the money! It's time EULA's were standardised by force of law, and publishers made to comply with the law. Here in Australia, consumers have an unwaiverable and absolute right to certain warranties that can NEVER be excluded – the most basic is that the product MUST perform as stated, and be fit for the purpose intended. I wonder if that's why software is so much more expensive here?!? Here’s a question: What happens when a company half-way through your contract, or say at the beginning of your next year, when their software has become an intricate part of your system they decide to update their EULA and you don’t agree with it? What then? I’ve seen some EULAs going to 50 pages of fine print. Who has the time to read AND comprehend all that? So you trust that the company is reputable and won’t try to cheat you. Keith Elliott rather large difference between looking at what alternate programs are being installed and reading the user agreement. the two are not connected. I had to pay just short of $100 because I did not read the EULA after I signed up for a highly discounted product. The EULA, which I did not read, said that if I didn't want to continue with getting the product on a monthly basis at a cost which was prohibitive I had to contact them within 14 days or so. Had I read this before I accepted, it would have saved me that first $100. I now read the fine print and have rejected several products that I would have tried and then been responsible for the high cost of being stupid! I agree with Ralph Retro. If you want the software it makes no difference whether you read the EULA or not. If you don't accept it then you can't use it. What is the point? We do have protection under the law for goods that are unfit for use. Very nice article. No one ever reads EULAs. If you don't read it, install the program/service and get all sorts of problems, that's on you. At least the company is giving you a subtle heads up. I guess that's why they call you Hap. You couldn't pay me $500 to read a EULA. Life is too short! So you pay for software you need and only learn about the conditions during installation! If you do not accept the EULA you have wasted your money you won't get a refund! They need to show you the EULA prior to the payment process and have you choose at that point! I actually take the time to do that now. If you don't accept the EULA, you don't get to use the software or service. So now what? I don't like ANY EULA, but I need to use some programs. I’d like a law limiting them to 1000 words or less.